Are you interested in solidifying foundational medical knowledge while refining clinical skills in a close-knit medical community that wants you to succeed? Then consider the Vernon Integrated Clinical Clerkship (ICC) program! Established in 2011, the Vernon ICC offers three Year 3 students an exceptional opportunity to complete this critical phase of medical training in the North Okanagan. Like all UBC Year 3 students, ICC students are expected to meet all UBC Year 3 curriculum objectives. Like all other UBC ICC sites, students are exposed to these objectives through ongoing relationships with faculty and patients that reinforce learning and develop core critical thinking skills. These core competencies will help you to develop into a successful Year 4 student, resident and eventually, independent physician. We are very proud of our Vernon “alumni”! Former Vernon ICC students have gone on to successfully match to residencies in family medicine, pediatrics, orthopedic surgery and internal medicine. Since June 2014, I have been the Site Director in Vernon and am tremendously proud of dedicated faculty and support staff who welcome the new students each year. It is a delight and extremely satisfying to witness the evolution of a Student-Reporter to a Medical Interpreter to a fledgling Medical Manager in just 11 months! Please consider joining us: You are welcome here! The Vernon Integrated Community Clerkship (ICC) program utilizes an educational model, similar to the Trail ICC program, that optimizes continuity of teaching and patient care. Student support is personalized to fit the needs of students to maximize learning opportunities and build connections within the local medical community. The Vernon program was first launched in 2011 and now provides three third-year clerkship spots. Previous students have given exceptional feedback on the quality of their educational experiences and preceptors in the Vernon program. Some have returned to the Okanagan for residency and to practice. Each student is teamed with two family medicine (FM) preceptors for two half days per week for the entire year. The FM preceptors act as primary preceptors, providing timely and consistent supervision and feedback. Students track patients through multiple clinical settings to maximize understanding and learning of the natural history of disease and patient care. This can include following patients from the FM clinic to specialty consultations, community referrals, the emergency department, a hospital admission, the operating room, and subsequent FM office follow-up. The student schedule consists of “mini-rotations” (1 to 3 weeks in duration) in all of the core specialties: anesthesiology, emergency medicine, general surgery, internal medicine, obstetrics/gynecology, orthopedics, pediatrics and psychiatry. All of these “mini-rotations” are repeated throughout the year. This step-wise learning allows students to build on past experiences and enhances learning and performance. Students are given graduated responsibility over the course of the year. Students participate in an inter-professional experience one half-day per week. Students have the opportunity to choose from a diversity of experiences in the community including Aboriginal health, chronic disease management, drug/addictions programs, home care nursing, emergency department triage, industrial/occupational health, and residential care. Throughout the year, flex weeks provide students time to pursue additional study, remediation time, and research opportunities. Students participate in one AHD per week. AHD sessions are led by local faculty or provided via videoconference and address curriculum-defined learning topics. Students take turns doing weekly case presentations to improve this critical skill of a Medical Expert/Communicator. VJH is a 180 bed hospital and the largest diagnostic and acute care facility in the region. 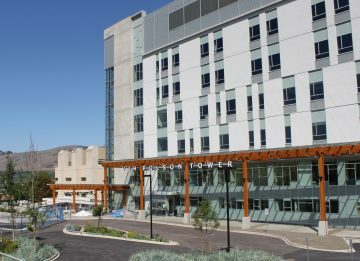 It serves as a major referral centre for health care in the North Okanagan, serving a catchment area of 86,000 people. The hospital offers core physician specialties, 24-hour emergency and trauma services, acute and obstetrical care. Dedicated UBC space (2780 ft²) that features centralized education areas, a clinical skills room, two video conferencing rooms, on-call sleep area, and lounge. The vibrant community of Vernon (www.toursimvernon.com) is the largest city in the North Okanagan with a population of 55,000. It has all the amenities of a major city and enjoys four beautiful seasons. The spring brings blooms to the orchards. The summer is filled with sunshine making our three lakes the perfect place to cool off. The fall is harvest season for food and wine lovers. Mild winters bring powder snow to the surrounding mountains for every outdoor enthusiast. The list of recreational activity is boundless including skiing at Silver Star Mountain and Sovereign Lake, hiking and biking in our provincial parks, golfing at one of our seven courses, rock climbing in Cougar Canyon, and boating or paddling at our three lakes. Vernon also has a recreational centre that boasts indoor swimming, dancing, lifting weights, fencing, aqua fit classes and much more. Vernon has a lively arts community with many galleries, a jazz club, a performing arts center, two movie theatres and a very active film society. For the sommelier, the Okanagan Valley wineries need no introduction. Kelowna International Airport, located 25 minutes away, is one of the top 11 busiest airports in Canada with 60 daily non-stop flights with nine different airlines. Students are strongly recommended to have access to their own vehicle to participate in the full extent of learning opportunities and recreational pursuits available during their Year 3 in Vernon.